When we think about special occasions throughout the year, such as Easter, Halloween and Christmas, it's quite worrying to think of how many sweet treats our children consume. 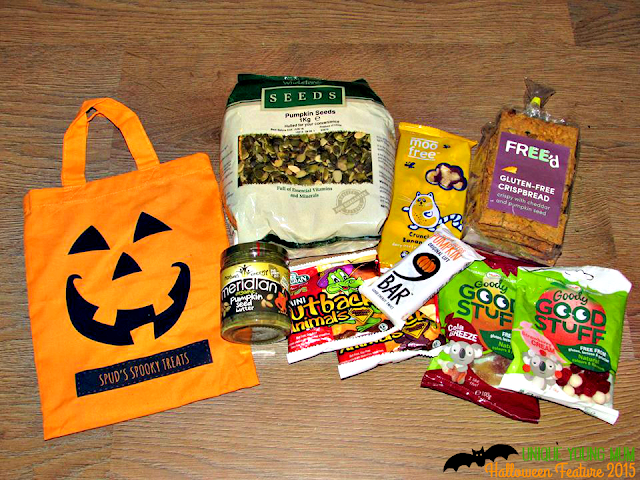 Wanting to try and change things slightly this year, I was thrilled when Holland & Barrett got in touch with some ideas from their Halloween range, items that are indeed more healthy then the treats we usually see at Halloween! If you've never shopped at Holland & Barrett, I'm convinced you've walked past one of their stores at least, with over 620 stores in the UK, the company is known as one of the UK's leading retailers of minerals, vitamins and herbal supplements, as well as having fabulous ranges for speciality diets such as gluten, wheat and dairy free etc. When we was given the opportunity to try out some Halloween themed snacks and treats, I took the opportunity not knowing what was going to arrive, unlike most opportunities we get here at Unique Young Mum. Keeping an open mind on what was going to arrive, both me and Spud was pleased with what did turn up, and not just because of the cute personalised pumpkin bag, that coincidentally goes perfectly well with his pumpkin costume! This tasty and crispy Free'd product, is topped with naturally aged mature cheddar and roasted pumpkin seeds for extra deliciousness. We're not sure about given them out to trick or treaters, but they'll go down fab at a Halloween party or as a Halloween themed lunch! We've had ours with some cheese, and broken down and dipped into our favourite savoury dips, the icing on the cake, they're high in fibre and omega 3! ✓ Egg Free, ✓ Gluten Free, ✓ Nut Free, ✓ Fish Free, ✓ Soya Free and much more! 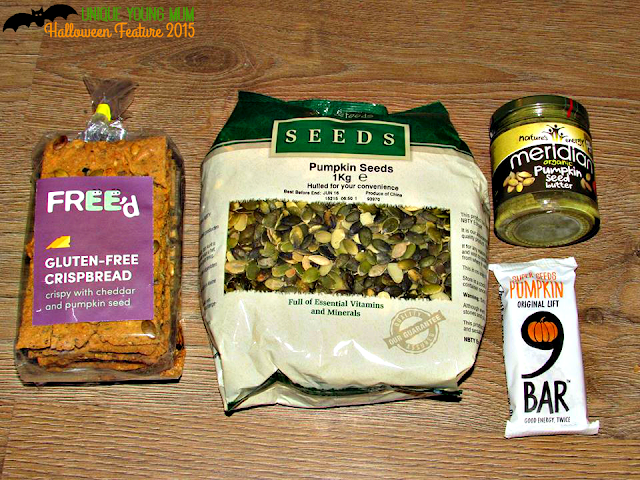 You may be thinking what on earth can you do with that many pumpkin seeds, and the answer is plenty! Mix them up with some dried fruit and some organic chocolate chip drops to make your own Halloween health treat bundles! Alternatively you can add the seeds to homemade muffins, granola or even a salad, the list of idea's are endless! Perfect for a Halloween themed breakfast, or a Halloween lunch, or even for sandwiches at a Halloween party, this product is made from only organic pumpkin seeds that are lightly roasted before being ground with a little organic sunflower oil and sea salt, into a smooth creamy texture! ✓ Egg Free, ✓ Gluten Free, ✓ Nut Free, ✓ Wheat Free, ✓ Fish Free, ✓ Soya Free, ✓ Milk Free and much more! This bar is packed to the gills with super-seed goodness, it's full of naturally nutritious sunflower, sesame and hemp, bringing you the energy you need to get through Halloween this year! It's high in fibre, vegan-friendly, gluten free and made with no artificial colours or preservatives! Every 9BAR bar which is sold, provides a night's clean, sustainable light for a child in Africa, bringing you two lots of goodness! ✓ Egg Free, ✓ Gluten Free, ✓ Wheat Free, ✓ Dairy Free, ✓ Yeast Free, ✓ Lactose Free and more! These naturally delicious cola flavoured gummy sweets, are free from gluten and lactose, and they're gelatine free making them suitable for vegetarians and vegans. Along with other products in the Goody Good Stuff range, such as the Strawberry and Cream, you can make up little treat parcels for any trick or treaters who may be vegetarian or vegan! ✓ Egg Free, ✓ Nut Free, ✓ Milk Free, ✓ Soya Free, ✓ Gluten Free, ✓ Wheat Free, ✓ Lupin Free, ✓ Sulphite Free and much more! Made with award winning, organic rice milk chocolate, Moo Free have covered this scrumptious bar in crunchy banana chips to make a surprisingly good combination! Maybe not something to give away to trick or treaters, due to the price, but indeed a treat to go in a Halloween hamper, or to give away as a prize at a Halloween party! ✓ Egg Free, ✓ Milk Free, ✓ Gluten Free, ✓ Wheat Free, ✓ Peanut Free, ✓ Lupin Free and much more! As above with the cola bottles, these sweet treats are naturally delicious, strawberry and vanilla flavoured gummy sweets. As they're suitable for vegetarians, mixed up with other varieties, and placed in small bags, they'd made the perfect trick or treat treats for little spooky door knockers! 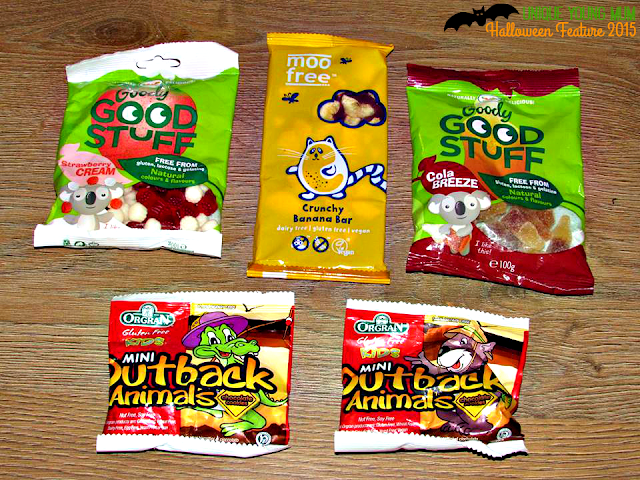 Made from naturally gluten free ingredients, the Mini Outback Animals chocolate cookies, come in 8 fun packs perfect for Halloween treats! They're rich in complex carbohydrates, and has the added benefit of psyllium for extra dietary fibre! 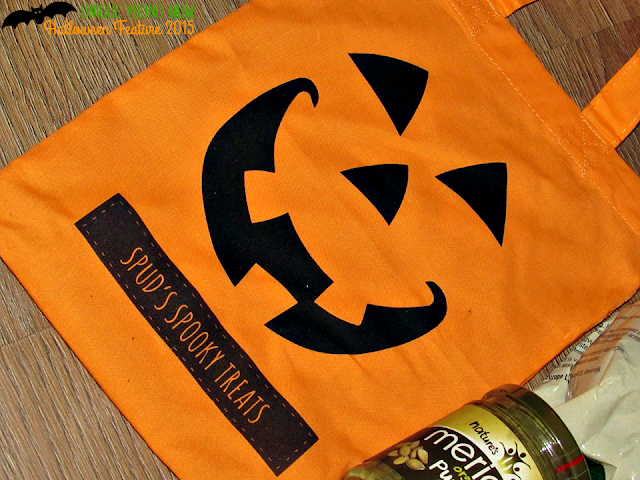 They'll be a great treat to give away to trick or treaters, or even in party bags at a Halloween party! ✓ Egg Free, ✓ Gluten Free, ✓ Wheat Free, ✓ Nut Free, ✓ Milk Free, ✓ Soya Free and much more! To find out more about the products mentioned in this post, or to view other alternative products for Halloween, or even all year round, visit your local Holland and Barrett store, or check out the website.